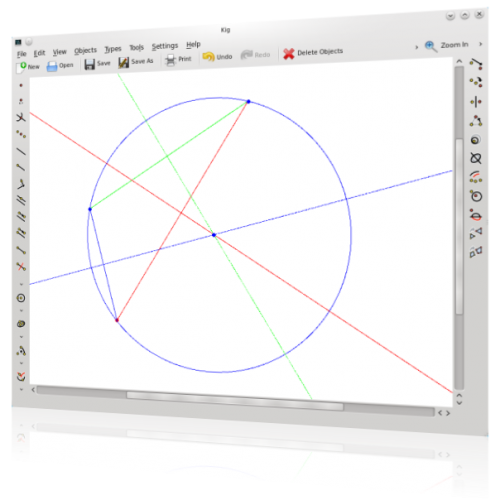 Kig is a program for exploring geometric constructions. It is part of the KDE Education Project. All three segment axes of a triangle intersect in one point which is the center of the circumscribed circle. Kig is meant as a better replacement for such free programs as KGeo, KSeg and Dr. Geo and commercial programs like Cabri. Kig is a useful and powerful utility for high school students and teachers, and as a fun project as well. We have learned a lot by working on it, and it's fun to work together with other people on it. You can select objects by drawing a box. Give each object a suitable name. 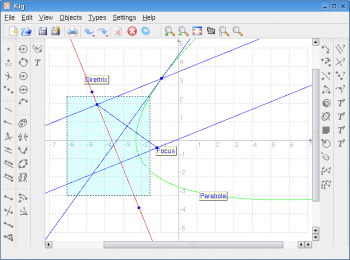 Kig has a tool for drawing regular polygons. 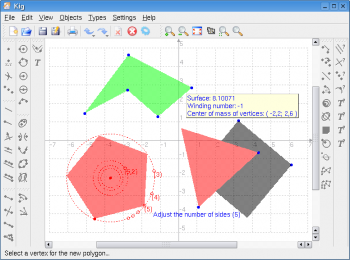 Arbitrary polygons are supported, too. Since Kig can import and use third-part macros as built-in objects, it can have new objects, being more and more powerful. If you don't know how to import a macro, please read the FAQ. This page was last modified on 3 December 2012, at 18:16. Content is available under Creative Commons License SA 4.0 unless otherwise noted.